The objective of the study was to determine whether the arrangement of the walls inside a small apartment is sufficient for natural ventilation when the door and window on opposite sides are opened and a small brise is blowing. A simple 3D CAD model was constructed from the 2D drawings of the building. Furniture was not included in the model because it was designed to be flexible anyway. The computational mesh was constructed automatically from the CAD. Several calculations were performed. The initial simulations were used to tune the modeling parameters and to optimize the convergence behavior of subsequent calculations. Simulations were performed for both winter and summer scenarios and for various wind situations. 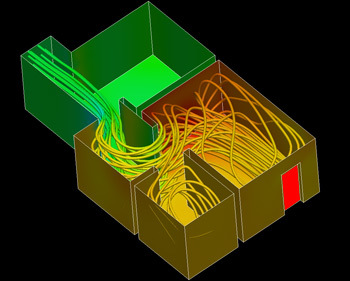 Image 1: Streamlines and pressure distribution for natural ventilation of a small apartment (red is high pressure, green is low pressure). Image 1 shows the streamlines and the pressure distribution for one particular environmental wind situation. Quite obviously, the large green room is completely excluded from the air exchange. This shows that additional windows or a change in the apartment plan is necessary. These analyses clearly show that, even in a relatively simple building geometry such as this, it is possible to predict interesting effects that might not have otherwise been apparent until the house was built. With parametric CAD and automatic meshing tools, it is possible to generate a good computational mesh in a small amount of time. Recalculating the simulations with walls, doors and windows at different positions takes just a few hours.